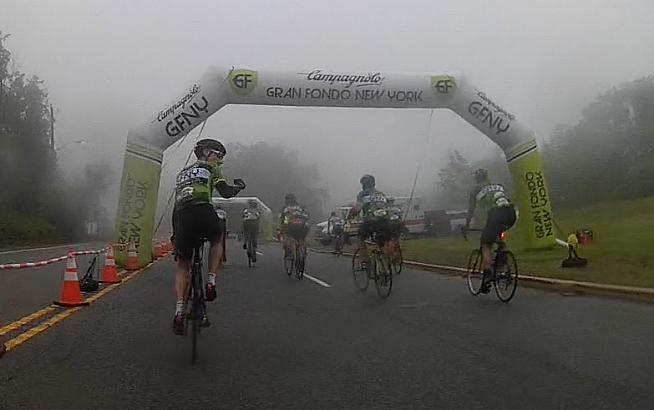 There is no mistaking the finish line at Gran Fondo New York. You know the end is nigh as you top the steep climb up Dyckman Hill from Palisades Park. Signs count down the kilometers and two blow-up arches frame the run to the finish gantry and timing mat. In the last quarter mile the enthusiastic announcer's congratulations become audible along with the shouts and applause of the spectators lining the final few yards behind the barriers. Campagnolo GFNY World Championship NYC completed, R&R is on offer just feet away at the after-party in the Finish Village. It's all just a two-minute ride from where the day had started on the George Washington Bridge. 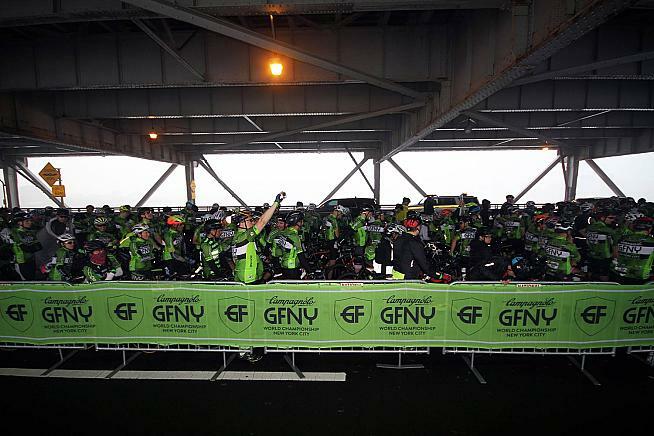 In every direction there were riders of all nationalaities in bright green GFNY jerseys with finisher's medals bumping against the chest. Bodies lounged on the grassy slopes, rehydrating, stuffing in calories, catching up, stretching, and greeting in dozens of languages friends and family who had come to the finish. After 100 miles and 8,000 feet of climbing the mood was celebratory with a side order of muscle cramps and limping. In 2017, I took full advantage of the finish zone's facilities and rarely has a beer tasted so good. I had crossed the line beaming, well inside my target time of six hours. This year there was a very different mix of feelings. Relief it was over, disappointment that a great few months of training had not resulted in a much better result, some satisfaction for getting around, comradeship with those finishing around me ... and a touch of nausea. Since Rune, my riding companion, had been waiting for a while and I did not fancy my chances of not tasting a beer twice — going down and coming back up again — we headed straight off leaving the sun-drenched park to the green-jerseyed who had enjoyed better days than me. Most of them I reckon. Manhattan starts to emerge through the mist just before the start. 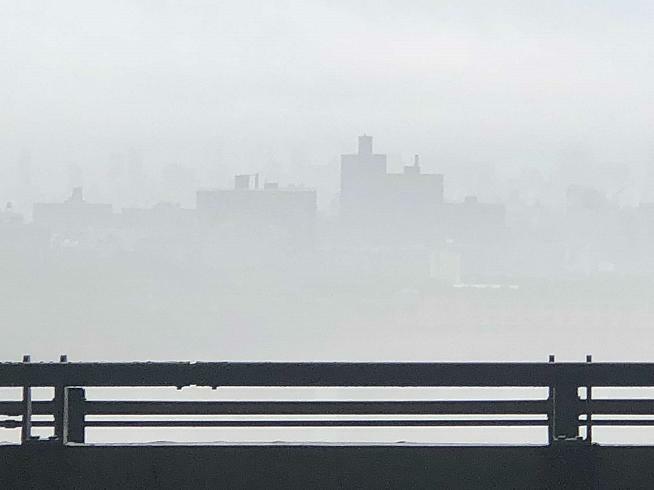 Despite a less than perfect lead-in to the event, the sight of the first Manhattan buildings emerging from the mist wrapped around the GWB just before the start was a promising sign for the day. I smugly congratulated myself on leaving the arm warmers, vest and rain jacket at home and remembering to slap on the sunscreen at 4-something am. An hour and a half later as heavy rain fell my mood was very different. And not just because I was very wet. 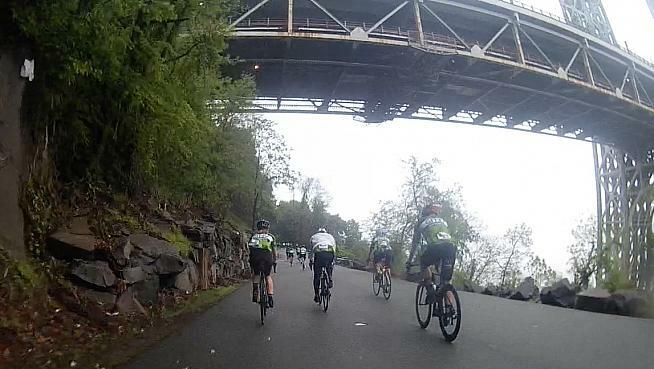 Looping under the GWB in Palisades Park. I never saw the stone I hit in Palisades Park, just heard it fly off and a few seconds later realized my tire was deflating. The minutes I spent stood in the damp ditch switching my tube as hundreds, if not thousands, of riders went past was less than fun. With "less haste, more speed/less haste, more speed" on constant repeat in my mind, I got the job done in about average time for me, which is in the middle ground between bike mechanic mastery and total embarrassment. I did manage to crack a smile as my CO2 inflator did its trick — magic! Then we were back on the move, which is when my mud-filled cleat refused to clip in. I tried to follow honest. Having made it to the top of Alpine and sorted out my shoe, Rune and I took a couple of turns each on 9W and slowly closed on a small group going just slower than us. As expected they jumped on our wheels and we had the makings of a paceline. 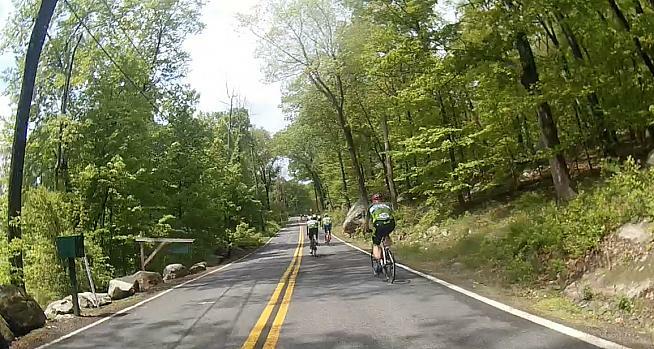 I rotated to the back and was enjoying the tow as we passed gaggles of riders. After a coupIe of minutes I realized that Rune was nowhere to be seen. Given that he had helped with my puncture, gone at my pace up Alpine and waited while I cleaned my cleats at the top that seemed fair enough. I'd next see him back in Fort Lee and he would go on to post a very decent time. The same could not be said for me. As I headed north along the Hudson it became more and more apparent that there was something wrong. My legs felt okay, but I was lacking in energy, everything was a bit blah, there was no zip. I was as flat as my tire had been. 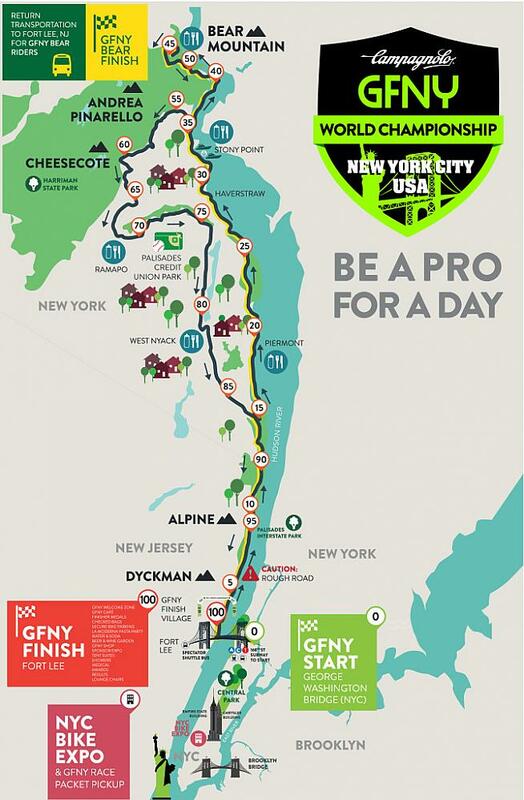 If I was being a pro for a day to use GFNY's motto it sure seemed that my pro experience this year was going to be that of an exhausted domestique grimly hanging on at the back of the grupetto during one of the final mountain stages of a Grand Tour. The adrenaline of the start and first few miles carving through Fort Lee's streets had masked the effects of a poor 48 hours of build up to the big day. I had felt unwell all Saturday to the point of almost throwing up that night and then suffered open-eyed through one of the worst nights of sleep in my life, racking up perhaps two hours though it felt like less. Not much later it started to rain. The combination of starting location and the early puncture put me well back in the field for the run up to Bear Mountain. 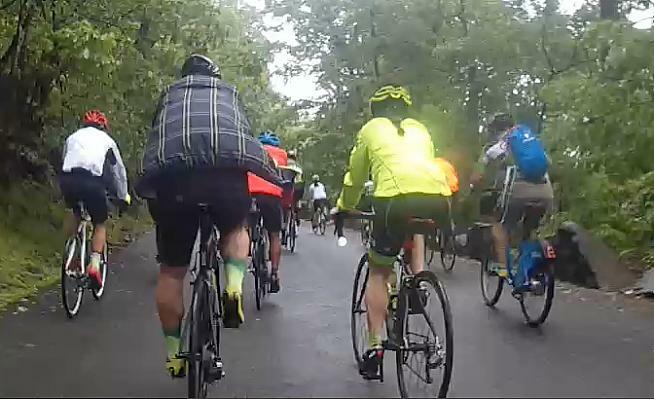 I tagged on to a few groups, but spent the majority of my time surfing from one rider to the next drafting for a few yard as I came up behind them like a naughty time trialer. Piermont, Haverstraw and Stony Point rolled by and despite the way my day was unfolding closed roads never get old. Those descending are probably 45 minutes ahead of those heading up. The rain had cleared by the time the climb to Bear neared and it was zip down from then on. 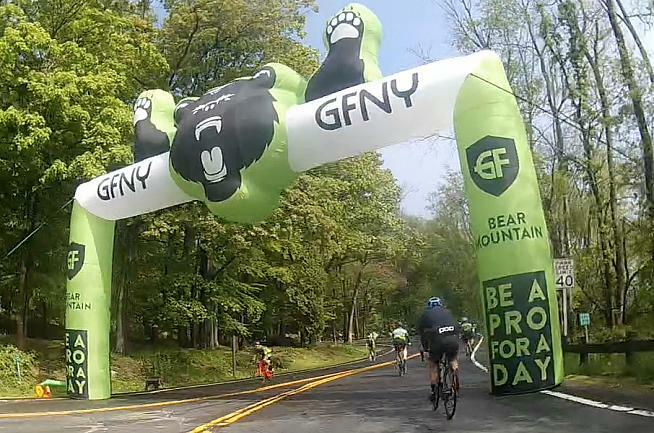 I saw the first walkers on "Baby Bear" just before the biggest climb of the day, which is a long, long way from the finish of the full gran fondo and still a good distance, and more importantly climb, from the end of the GFNY Bear 50. I have gone up Bear Mountain enough times for it to not hold any surprises as we rose out of the mist and were met by clear blue skies. That could not be said for some of my fellow climbers. The ramp on Perkins Memorial Drive definitely caught some unprepared. A quick fill of the bottles, pee break and text to the family at the top and I clipped back in and pysched myself up for the challenges of the section to the next rest stop — 20 miles with a fair proportion of the day's climbing in it. The psyching up was I have to admit of an intensity that matched my energy levels. Less "I am going to smash it" and more "best get on with this I suppose". And that's how the rest of the day played out. Reaching the top of the long drag up Pinarello. The Andrea Pinarello and Cheesecote climbs came and went at a steady pace as the temperature rose. In previous years, coming over the top of Cheesecote has been a woo-hoo! 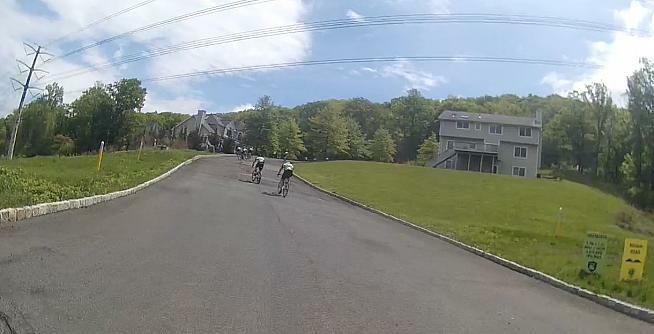 moment as the descent is a wide-open fast woosh through a neighborhood of McMansions as celebration of the the bulk of the climbing being behind you. It was more of a "meh" this time. The conundrum was that the legs still felt okay, perhaps even good. It was the rest of me that was empty and lacking any energy or drive. My get-up-and-go had got up and gone. Keeping my head down, the miles ticked over until it was time to return to the Palisades, a section that always deceives. Despite having ridden it a few hours earlier I always imagine it is a sharp descent down to the riverbank followed by the even sharper kick up Dyckman Hill to the finish. The reality is longer and more up and down. 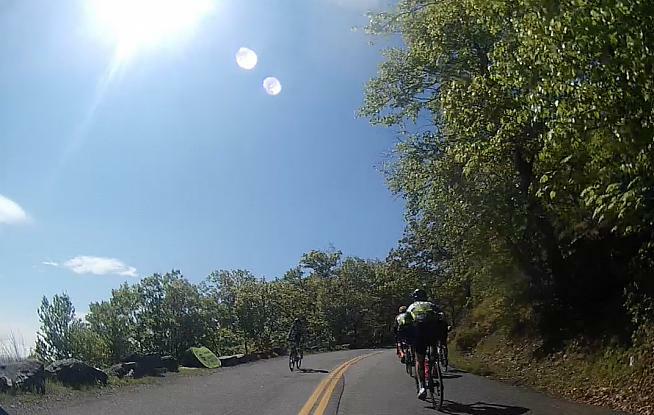 Finally, Dyckman with its proper hairpin and sharp bend at the summit tested what was left after 98 miles and the drag to the finish line arrived. Cheesecote forces almost everybody out of the saddle. 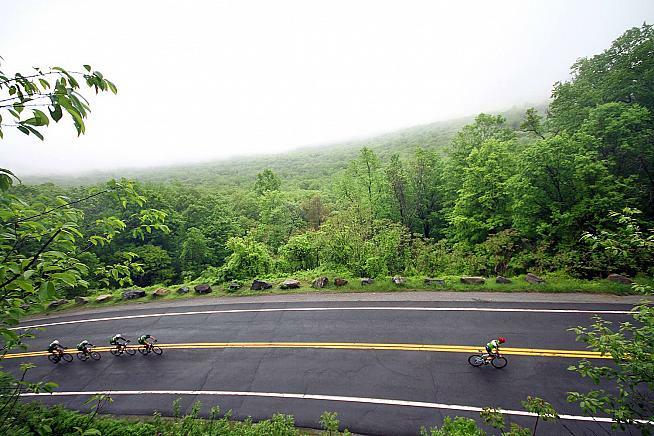 The greatness of the gran fondo format is that it encompasses and welcomes everyone. 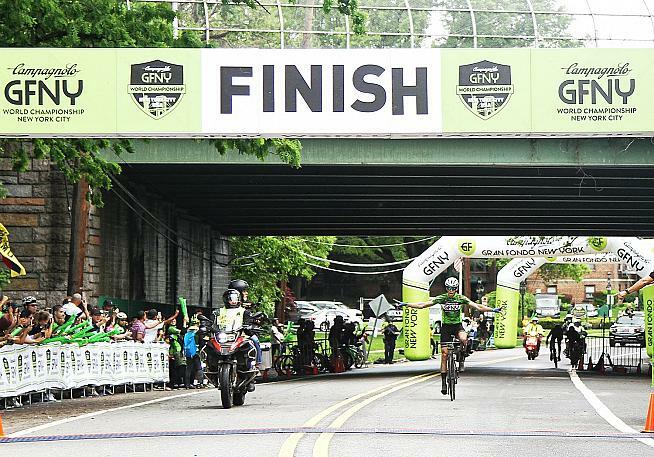 From Mike Margarite and Natalia Navarro Cerdas, who won overall titles by a matter of seconds, to the riders 2,700 places and close to seven hours behind them, everyone takes on the ride on his or her terms. You can even ride a Citibike if you are absolutely mad. Chapeau to the Citibike man! Everyone benefits from the slick organization, everyone experiences the spectacle of the start, everyone enjoys the closed or controlled roads, everyone is fed and sports-drinked at the aid stops and everyone feels part of an big event. And, of course, everyone enjoys the celebratory party at the finish. Well, everyone except for those of us who slunk home feeling as green as their jersey.